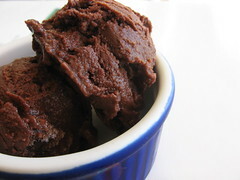 Chocolate Mint Sorbet - Do You Know The Muffin Man? Notes: Using some leftover lemon mint that I had, I left it in the water for couple of hours before making the sorbet base. I didn't have crème de cacao so I used Talea amaretto cream instead; some peppermint oil helped to boost the mint flavour too, as the fresh mint wasn't so fresh. This is a very dark, very chocolatey sorbet, not like ice cream at all. The mint flavour seemed to mellow after a night in the freezer; it was initially quite strong.